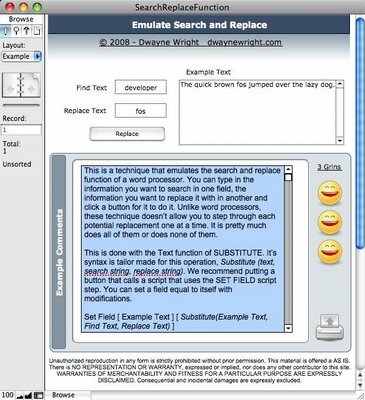 This is a technique that emulates the search and replace function of a word processor. In fact, it loosely emulates the search and replace feature built into FileMaker. This version is simplified and uses the substitute functions. You can type in the information you want to search in one field, the information you want to replace it with in another and click a button for it to do it. Unlike word processors, these technique doesn’t allow you to step through each potential replacement one at a time. It is pretty much does all of them or does none of them. This is done with the Text function of SUBSTITUTE. It’s syntax is tailor made for this operation, Substitute (text, search string, replace string). We recommend putting a button that calls a script that uses the SET FIELD script step. You can set a field equal to itself with modifications.